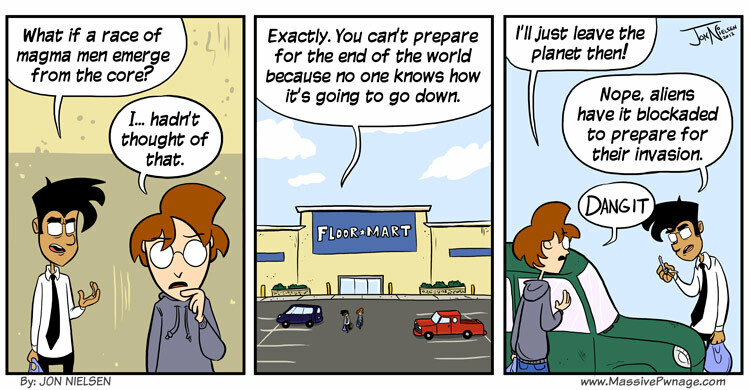 Am I the only one that thinks “Floor Mart” is funny? Well, my wife thought it was funny too so I guess there’s at least one person on my side. This entry was posted on Wednesday, January 4th, 2012 at 12:00 am and is filed under Comics. You can follow any responses to this entry through the RSS 2.0 feed. Both comments and pings are currently closed. Then we must fly to the sky! Also, your married?! Strange, for some reason i didnt picture you to be married. why did you not think he might have been married, he has more to his life than these comics y’know. Wait since when did people on the internet have lives other than the internet!? Does your wife play skyrim by any chance? Haha, i never forgot about that one. Damn was he good at Diablo 2 though, that Barbarian stomped everything. I dont think your 57 though, my guess is probably closer to 27 at most, though im probably wrong.